Recency bias occurs when people more prominently recall and emphasise recent events and observations than those in the near or distant past. Consider the following simple example: a passenger peers off the viewing deck of a cruise ship and spots precisely equal numbers of green boats and blue boats over the duration of her trip. However, if the green boats pass by more frequently toward the end of the cruise, with the passing of blue boats dispersed evenly or concentrated toward the beginning, then recency bias could influence the passenger to recall, following the cruise, that more green than blue boats sailed by. This same phenomenon happens frequently in the minds of investors. Humans have short memories in general, but memories are especially short when it comes to investing cycles. During a bull market, people tend to forget about bear markets. As far as human recent memory is concerned, the market should keep going up since it has been going up recently. Investors therefore keep buying stocks, feeling good about their prospects. Investors thereby increase risk taking and may not think about diversification or portfolio management prudence. Then a bear market hits, and rather than be prepared for it with shock absorbers in their portfolios, investors instead suffer a massive drop in their net worths and may sell out of stocks when the market is low. Selling low is, of course, not a good long-term investing strategy. Recency bias on a macro scale can lead markets to move up and down in an exaggerated way. In fact, recency bias exacerbated the stock market downturn in 2008-2009. And when the market is down, investors become convinced that it will never go back up; they reduce risk at exactly the wrong time and stick their heads in the sand. Recency bias overrides the market's collective sense of rationality. But the market starts to go back up, and investors hesitate. And before we know it, markets have bounced back 20% to 30%, and investors are still sitting on the sidelines. To counteract the effects of the recency bias, many practitioners wisely use what has become known as the "periodic table of investment returns," an adaptation of the scientific periodic table of chemical elements. Because many investors do not pay attention to the cyclical nature of asset class returns, securities or asset groups that have performed spectacularly in the very recent past appear unduly attractive. Often the best performing asset classes in one year or two years in a row are at the bottom of the table in subsequent years. That's the nature of investing: asset classes can go from being priced at a "fair" value to becoming overvalued, undervalued, or anywhere in between, just like a pendulum swinging from one extreme to the next. 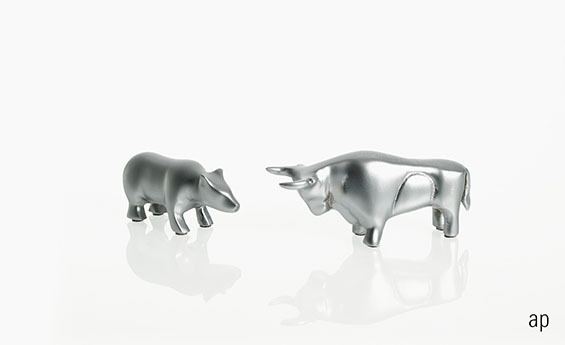 It's therefore critical for investors to remain disciplined to achieve their financial goals. The author is a freelance contributor to Morningstar.com. The views expressed in this article may or may not reflect the views of Morningstar. Michael M. Pompian The author is a freelance contributor to MorningstarAdvisor.com. The views expressed in this article may or may not reflect the views of Morningstar.